The National Bike Challenge was a friendly competition from May through September of this year, pitting individuals, teams, and regions against one another over who can log the most miles on our bicycles. 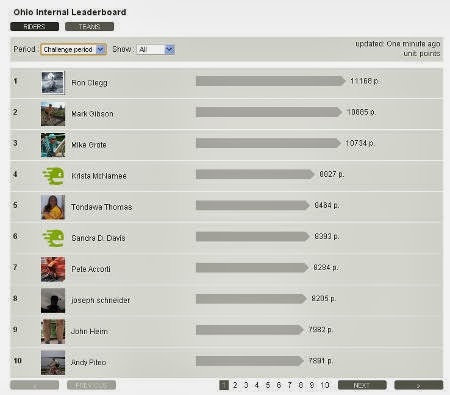 It didn't matter if you ride for transportation, leisure, racing, mountain biking, or whatever, every mile that you logged using the Endomondo app or manually at the Endomondo web site counted! 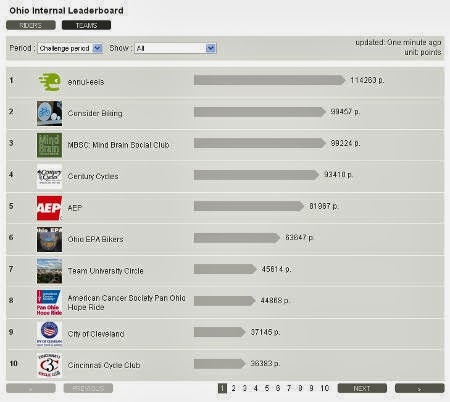 First and foremost in the minds of Northeast Ohio cyclists was the Rust Belt Challenge, where we in the Cleveland area faced off against cyclists in the Pittsburgh region. Alas, after all miles were logged and totals tallied up, Pittsburgh came out the winner. Actually, Cleveland DID ride more total miles than Pittsburgh, but bonus points were awarded per bike trip, and it was Pittsburgh's greater number of trips that pushed them over the edge. There will be a celebration in Youngstown this Friday, October 18. Groups of cyclists will from both Cleveland and Pittsburgh will ride their bikes and meet at The Boxcar Lounge (534 Mahoning Ave in Youngstown) to exchange the Rust Belt Crown. See www.facebook.com/RustCrown for more details and to RSVP. The good news is that Ohioans, and especially Northeast Ohioans, made a good effort towards the challenge. The state of Ohio came in 9th overall among all 50 states and the District of Columbia during the May-September challenge period. Our own Krista McNamee from the Century Cycles store in Rocky River was the TOP FEMALE rider in Ohio! 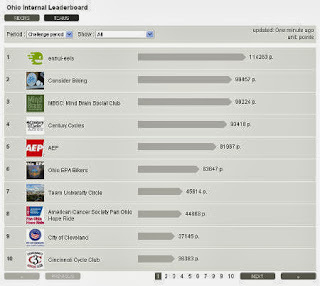 And the Century Cycles team ranked 4th out of 146 registered teams in Ohio! Way to go Krista, and thanks and way to go to all of our staff, customers, and friends who joined our team!